VOLUNTEER PROGRAMS & OPPORTUNITIES 32 | For more information call 425-430-6600 or visit Rentonwa.gov r O PP O R T U N I T I E S TO G I V E BAC K GENERAL VOLUNTEER INFORMATION Contact Teresa Nishi 425-430-6694 tnishi@rentonwa.gov For more volunteer opportunities visit rentonwa.gov/volunteers or JustServe.org Adopt a Park Program The City provides the tools and assigns an experienced Parks staff to find the right park for your group to get involved, give back, enjoy the outdoors, and see the fruits of your labor. Info: Teresa Nishi at 425-430-6694 or tnishi@rentonwa.gov Become a Sponsor! Sponsorship can provide your company or organization an opportunity to achieve a high degree of visibility within the local commu- nity. Sponsorship oppor tunities can be for one-time or ongoing programs, ac tivities, or events, which are tailored to a variety of groups, interest, and ages. 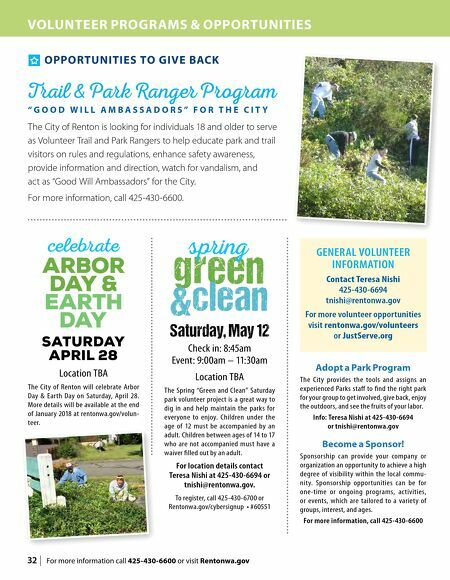 For more information, call 425-430-6600 Saturday, May 12 Check in: 8:45am Event: 9:00am – 11:30am Location TBA The Spring "Green and Clean" Saturday park volunteer project is a great way to dig in and help maintain the parks for everyone to enjoy. Children under the age of 12 must be accompanied by an adult. Children between ages of 14 to 17 who are not accompanied must have a waiver filled out by an adult. For location details contact Teresa Nishi at 425-430-6694 or tnishi@rentonwa.gov. 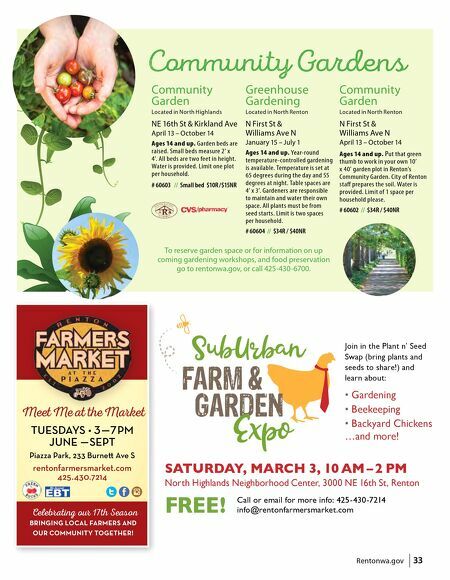 To register, call 425-430-6700 or Rentonwa.gov/cybersignup • #60551 celebrate Saturday April 28 Location TBA The City of Renton will celebrate Arbor Day & Earth Day on Saturday, April 28. More details will be available at the end of January 2018 at rentonwa.gov/volun- teer. Trail & Park Ranger Pro gram " G O O D W I L L A M B A S S A D O R S " F O R T H E C I T Y The City of Renton is looking for individuals 18 and older to serve as Volunteer Trail and Park Rangers to help educate park and trail visitors on rules and regulations, enhance safety awareness, provide information and direction, watch for vandalism, and act as "Good Will Ambassadors" for the City. For more information, call 425-430-6600.